Erlind Trigo and her niece Miriam weep as they look at family photographs which they salvaged from their home in the aftermath of Tropical Storm Harvey in Houston, Texas, U.S. September 2, 2017. 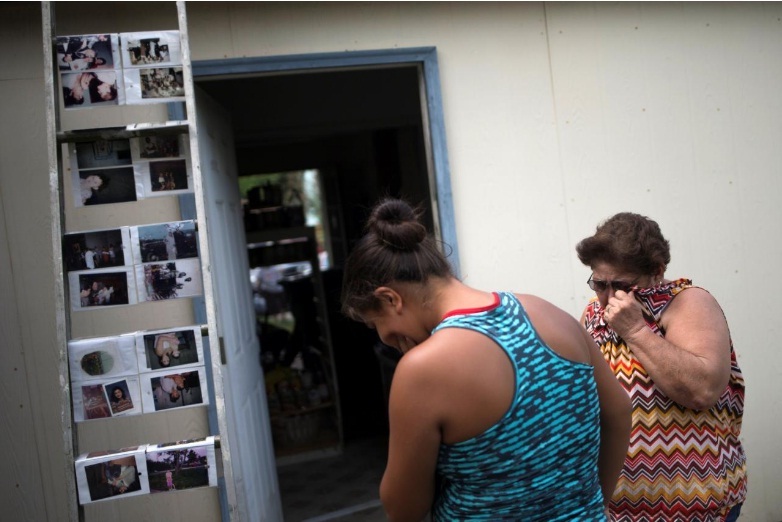 HOUSTON - As flood waters recede from Hurricane Harvey, thousands are set to return to their homes on Sunday to survey damage from unprecedented flooding that devastated densely populated areas of Texas, as worries mount about health risks. Harvey, which came ashore on Aug. 25 as the most powerful hurricane to hit Texas in 50 years, is expected to be one of the costliest natural disasters in U.S. history, having displaced more than 1 million people and leaving wreckage in an area stretching for more than 300 miles (480 kms) which officials said would take years to repair. Thirteen Superfund sites, heavily contaminated former industrial zones, in Texas were flooded or damaged by Hurricane Harvey, but the full impact on surrounding areas was not immediately clear, the U.S. Environmental Protection Agency said on Saturday. The announcement came amid rising concern about the health risks posed by Harvey’s record floodwaters, which contain a toxic soup of chemicals, oil and bacteria from Houston’s notoriously leaky sewer system. The city of Houston ordered a mandatory evacuation on Sunday for about 4,600 residences in the western sector, where several hundred people have not left their homes and flooding is expected to last for another two weeks. “Put your own personal safety above your property,” Mayor Sylvester Turner said, adding residents should consider the safety of first responders who would have to handle any emergencies. The evacuations, put in force by shutting off of power, were set to take effect at 7 a.m. CDT. The damage from the storm is also posing an economic and humanitarian challenge for U.S. President Donald Trump, who visited Houston on Saturday and met some of the thousands of people in evacuation shelters and rescue workers who have helped shuttle survivors to safety. The visit gave Trump an opportunity to show an empathetic side, after some criticized him for staying clear of the disaster zone during a Texas visit on Tuesday. Trump said he did not want to hamper rescue efforts. The Trump administration on Friday asked Congress for a $7.85 billion appropriation for response and initial recovery efforts. Texas Governor Greg Abbott, who accompanied the Trumps, has said his state may need more than $125 billion. For many in the Houston metropolitan area, which has an economy as large as Argentina‘s, losses to individual families were cataclysmic. In a neighborhood in east Houston, streets were lined with 8-foot (2.4 meter) piles of soggy debris, including mattresses, carpets and other belongings ripped out of homes. Adrian Rodriguez returned on Saturday to his flood-hit home there where he lives with his wife and three young boys. “I lost everything. All my children’s pictures of them growing up. Their birthday pictures. Vacation pictures. Their school projects of what they wanted to be when they grow up,” he said. Many areas were still battling floodwaters from swollen rivers that were expected to last for a week or more. In Beaumont, about 85 miles (140 km) east, officials were trying to repair a flood-damaged pumping station that caused the city of about 120,000 people to lose drinking water for days. As of Saturday morning, nearly 200,000 homes have suffered flood damage and about 12,600 were destroyed, according to the Texas Department of Public Safety. The storm shut about a fourth of U.S. refinery capacity, much of which is clustered along the Gulf Coast, and caused gasoline prices to spike to a two-year high ahead of the long Labor Day holiday weekend. Meanwhile a new storm, Irma, strengthened on Friday into a Category 3 hurricane on the five-step Saffir-Simpson scale. It remained more than 1,000 miles from the Leeward Islands, where residents were advised to monitor its progress. The National Hurricane Center said in an advisory late Saturday night it was still much too early to determine what direct impact it might have on the Bahamas and the continental United States.